My husband, Capt. John Rains, and I cruised out of San Diego Nov. 6 as members of the FUBAR Odyssey powerboat rally from Southern California to La Paz, sponsored this year by Long Beach Yacht Club. The Selene 59 we were guests aboard was among 35 boats participating in the event. The cruise’s first stop was Ensenada, where all the participating boats formally cleared into Mexico. The CIS offices adjacent to the harbor make Ensenada the easiest place to do that. All the offices needed are in one convenient building — including immigration, customs and port captain offices, fishing and park permit offices, and a bank where you can pay all the necessary fees. Our international clearance procedures took about two hours and cost about $100, including the required temporary import permit. In other places, such as Cabo San Lucas, the offices that boaters must visit are scattered around town, and each stop requires a different bank visit — so, the clearance process usually takes all day, and sometimes two days. Part of the FUBAR fleet berthed at Marina Coral, which has its own breakwater-enclosed yacht basin, 2.75 miles north of town. Marina Coral has its own fuel dock and is associated with the gated Hotel Coral resort. We fueled at the only fuel dock with its own pumps at Marina Coral. Fuel was priced at about $3 a gallon, which was good news for visiting boaters whose last fueling was in the U.S. — at prices of up to $5 a gallon. The rest of the FUBAR participants — or “FUBARistas” — got slips in Ensenada Cruiseport Village Marina, inside the municipal harbor. Under the new dockmaster, Jonathon Cervantes, the marina is back in good shape. Because Ensenada Cruiseport Village is part of the cruise ship terminal, security is strict. You’ll need a marina ID card to get through the security-guarded gates, on foot or in a vehicle. Ensenada Cruiseport Village is the newest marina in town, and although it has no dedicated fuel dock, powerboats needing a lot of diesel can order fuel truck delivery at the guest dock. Ensenada’s main tourist streets were quiet, even for weekdays — due to bad press about drug violence elsewhere in the nation that has had a negative effect on tourism. All 175 FUBARistas felt very safe walking around, going golfing, shopping and vineyard touring. Everyone we spoke with was friendly and helpful — and we experienced no problems anywhere. Marina Baja Naval hosted a dinner party for the entire FUBAR fleet, in a huge tent erected on its boatyard property in the main harbor. Marina Coral and Ensenada Cruiseport Village also sponsored this dinner. Nine local restaurants provided the food — and boaters feasted on steaks grilled to order, fresh seafood, salads, Italian dishes and fabulous desserts. The port administrator welcomed all FUBAR participants. Tomas Fernandez, the founder of Baja Naval, told us how he happened to build a marina here. After sailing his own cruising boat from the U.S. East Coast and through the Panama Canal in 1987, his boat needed repairs when he was passing Baja California. However, at that time, he could find no yacht-friendly docks, haulout facilities or yacht supplies in this region — just commercial fishing businesses and services. After Fernandez gathered what he needed to repair his boat and other yachts in the area, he created a facility that soon grew into a full-service marina and boatyard next to the navy base, inside Ensenada Harbor: Baja Naval. Today, his son Roger runs the marina and the original boatyard. 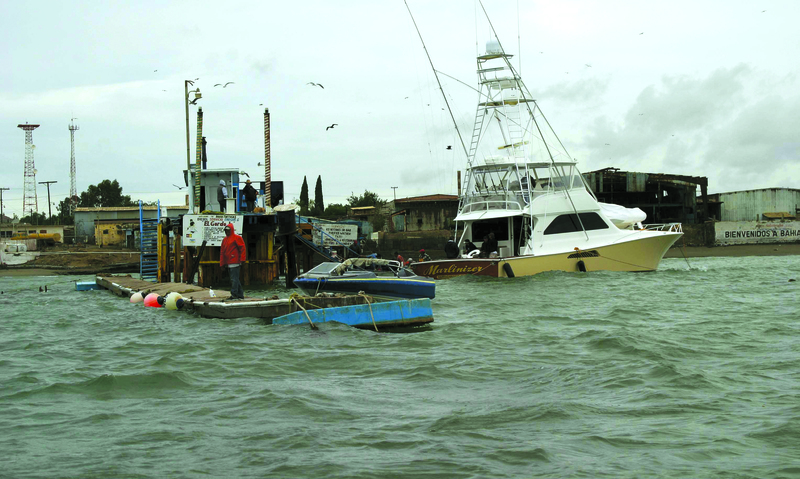 His other son, Tomas, runs Gran Peninsula: the company’s second and larger boatyard, on the north side of Ensenada Harbor. After two nights in Ensenada, the FUBAR fleet departed on the cruise’s next leg — a 30-hour run to Bahia Tortugas, which most cruisers simply call “Turtle Bay.” Participants enjoyed calm seas and Force 0 winds: perfect powerboating conditions. However, the weather forecasts all called for intense low pressure (down to 1002 milibars) to hit Turtle Bay the day after our arrival there. Under sunny skies, the FUBAR boaters all came to anchor off town, in the north end of the bay. Turtle Bay is a fine natural harbor, with plenty of room for a fleet this size — or larger. But the main anchoring area around Turtle Bay’s very old pier is open to the south. The low-pressure cell was approaching from the northwest, and the storm center was predicted to go ashore 30 miles north of us. This storm and its track were unusual, because they normally strike much farther north in California. South winds of 20 to 25 knots were predicted for Turtle Bay, so many boats took fuel that first day — either from Annabell’s fuel panga, which comes out to the anchorage, or by med-mooring off the pier. At about midnight, the wind increased from the south and southwest, blowing straight into the north anchorage from the bay’s opening. Combined with rain squalls, this first band of the storm made the harbor choppy for a few hours, and then it died down. But the barometer was still plummeting, so we suspected this was not the main event. The FUBAR committee had paid in advance for six Turtle Bay panga drivers to provide water taxi service, and they were in high demand, asking only for a tip. When we went ashore the next morning, the harbor was still choppy. Getting ashore was downright hazardous, due to the old pier’s detached, tilted dock sections that bounced in the waves. The pier’s rusty 15-foot-high iron stairs tilt downward and are missing a few steps. Ashore, Turtle Bay’s dirt streets had turned to slippery mud. But the local people were great to us. John and I needed some cash for unanticipated expenses. We slogged our way to the bank, next to the bus station, to use its ATM (Cajero Automatico), but both were closed for the weekend. After asking around, we were directed to La Purisima, the two-story grocery store that used to be painted yellow but is now painted gray. Senora Carmen, the manager, said, “No problema.” She ran our card, giving us pesos at the standard bank rate of about 13 to 1. She had a birthday cake on her desk for two of her employees, and she served us two pieces as we waited and shopped. We have found that, once you get away from the hectic pier, the people and businesses of this remote community are friendly and efficient — AND hospitable. By afternoon, the south wind and swell were kicking up, making it more difficult to get down the pier into a panga — especially loaded with groceries and other purchases. One crew was lugging a new battery. We hope this rickety old pier will someday be replaced by a floating pier that better accommodates boating tourists. With 30-knot winds and 4-foot swells raking the town anchorage, most of the FUBAR fleet moved over to shallow El Rincon, at the southwest corner of the bay, for better protection from south wind. They had to weave their way through 200 strings of aquaculture buoys to get in there before dark. The storm’s center arrived during the night, so it was a wild ride at anchor for everyone. But now, with daylight approaching, strong north winds were predicted to follow — turning the south corner, El Rincon, into a lee shore. Would we all manage to untangle ourselves and snake our way back out to safety? Find out, as our story continues in the Dec. 9-22 issue of The Log Newspaper.